I’ve been doing medical missions as a physical therapist over the past two years and started a blog to increase awareness called goonamission.blogspot.com. As I was planning a trip to Costa Rica with my daughter and 3 other couples, my 14 year old asked what we could do to help in Costa Rica. That’s when I set to work finding the perfect mission opportunity for our group. Luckily I found pack for a purpose and our wonderful local assistant Wendy Holt who went above and beyond to make sure we knew exactly what the school and orphanage needed. 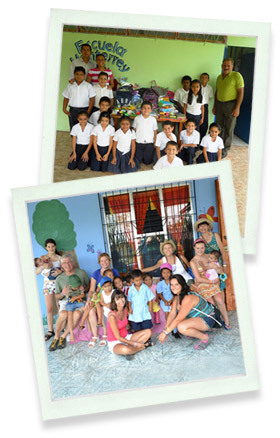 In the end we brought over 200 pounds of shoes, books in Spanish, backpacks and school supplies! We also were able to spend a memorable morning at the orphanage. It was a perfect start for the 3 teens in our group to see how helping out makes a difference.